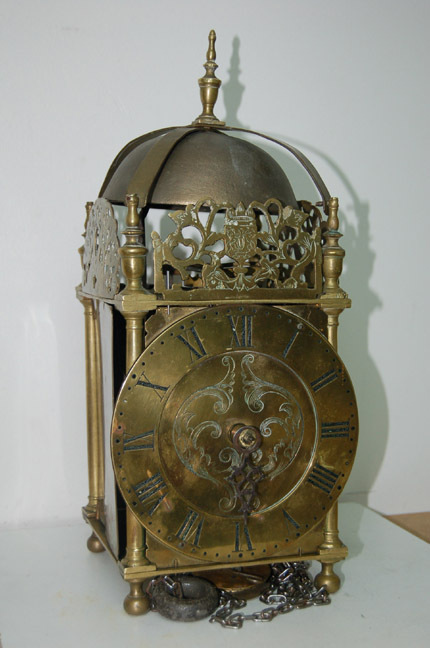 I bought this clock knowing there were a number of major issues with it as there usually are with clocks some three hundred years old. 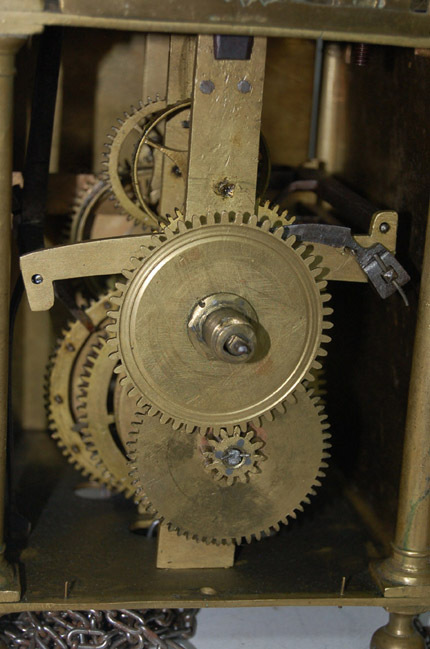 It had been converted from a single hand to a two handed clock and the dial was later than the rest of the clock as were the frets and bell straps. However the price was right, it was in working order and the clock had potential. While unfortunately this clock could never be original again I felt that the restoration I wanted to undertake would rectify bad repairs and workmanship. The good news was that the clock case and wheel work appeared to be from before 1700. The evidence for this was the tapered wheel arbors and the wheels being planted directly onto the arbors without collets. 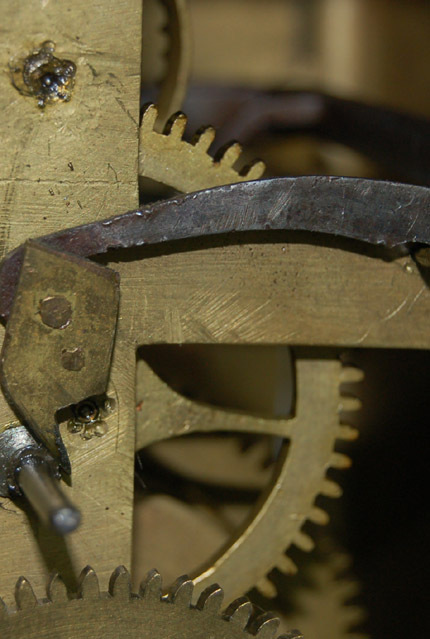 Darken and Hooper in their book English 30 Hour Clocks suggest that this method of wheel planting changed around 1680 to include a collet formed as part of the arbor, presumably recognising this as a more robust method of supporting the wheel. 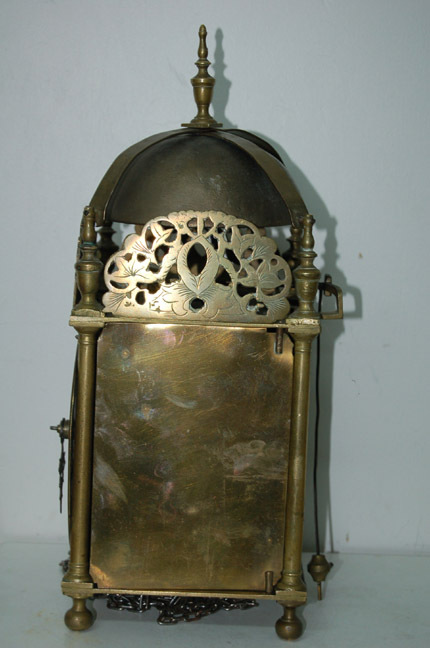 Brass collets are generally used later. 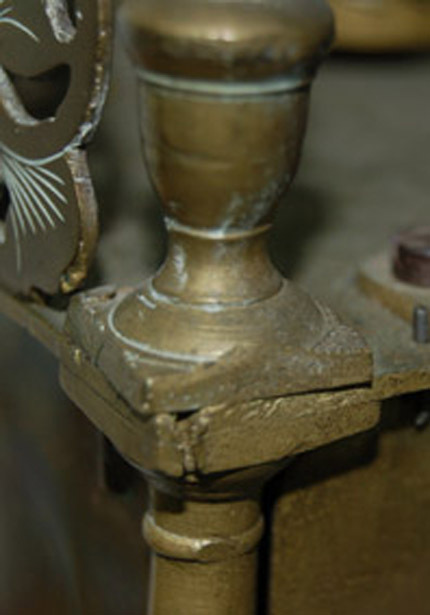 The case itself had been apart (no idea why that was necessary) and put back together poorly so that on the plate corners top and bottom there were significant mismatches where the three component parts, plate, column and finial (or foot) met. 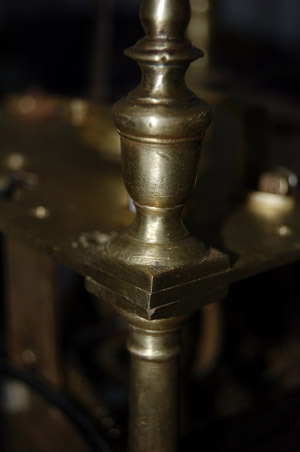 This doesn’t happen on French lantern clocks where the column, foot and finial is a one piece casting. 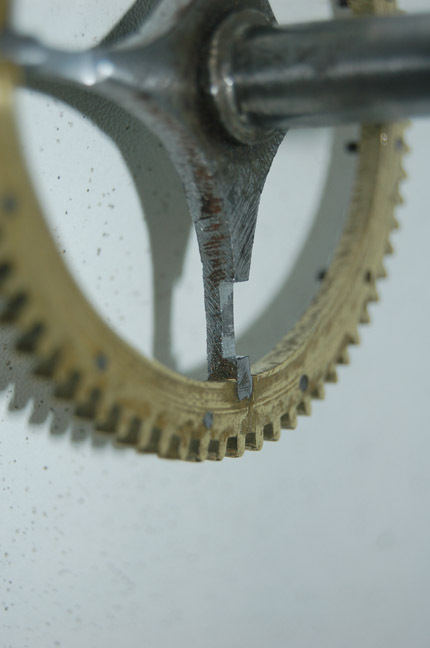 Usually the maker or the repairer will mark each of the parts so the clock goes together correctly. That hadn’t been done with this clock. 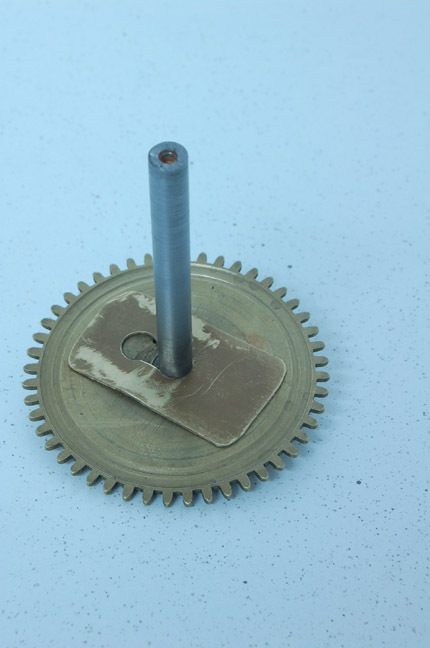 The retaining threads holding these parts were also all stripped or close to it and crude rivets had been banged in to hold the clock together. I replaced all the ruined brass studs with steel studs and tapped in new threads. A little hole patching on the finials with filler rod and careful filing cleaned up most of the problems. When reassembled the corners are still not perfect but the case looks much tidier. I really did not like the two handed setup on the dial as this had certainly originally been a one handed clock and I was even more unhappy when I took off the dial and saw what was underneath. 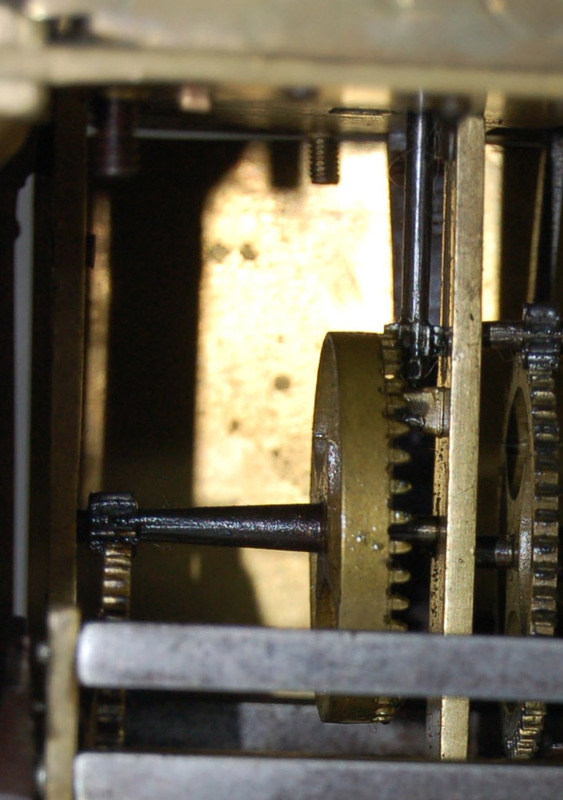 30 hour longcase wheels had been modified and installed to provide a two handed setup and the lifter which previously set off the hour strike had been butchered and bent to lift on a pin at the bottom of the minute wheel cannon pinion. 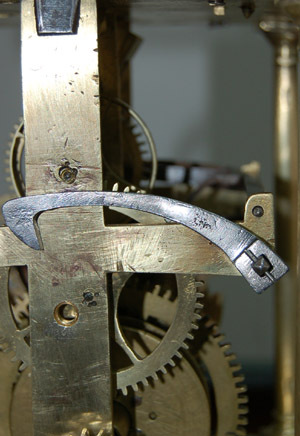 The photos below show the 30 hour longcase wheels forming the motion work, the butchered lifter and the remade lifter, formed by welding on a new end and reshaping. Note the higher set of the new lifter which will accommodate the larger diameter star wheel. 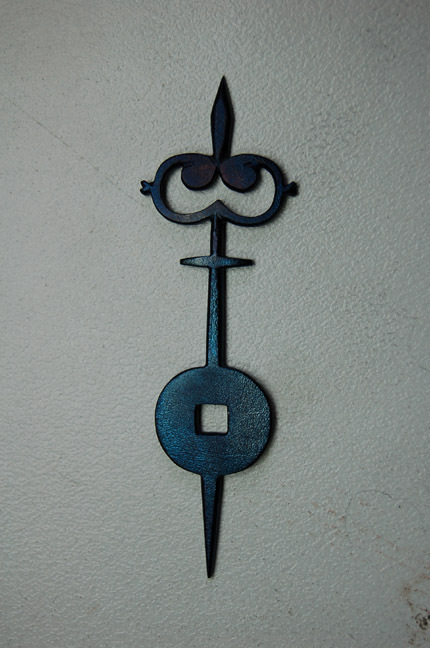 The point of the hook is to the left of centre of the vertical plate so that the inside of the lifter hook does not foul the back of the star wheel as it drops. Also the cannon pinion stud has now been replaced with a pivot hole ready for the new hour hand shaft and star wheel assembly. 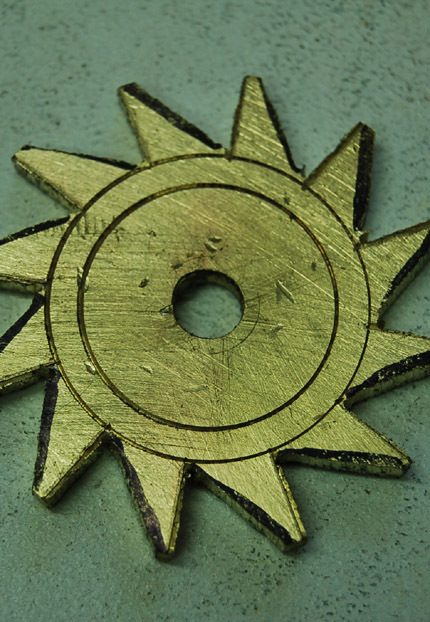 The star wheel was made by supergluing a 3mm brass disc on to a steel mandrel then turning to size on the lathe. The 12 divisions were marked using a dividing head. The second photo shows the teeth roughly cut by hand. The marker pen lines were there to provide a clearer indication of where to cut. 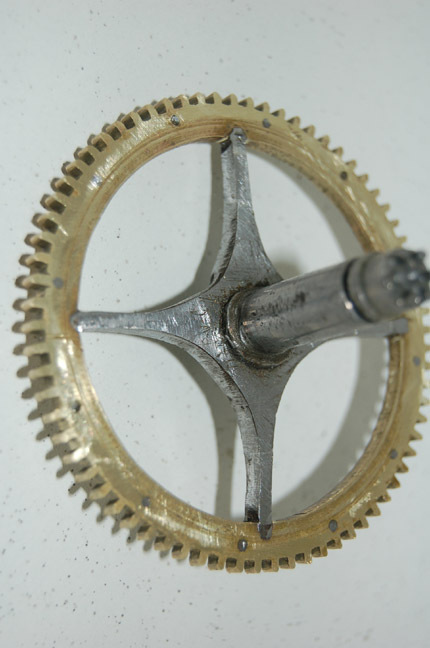 The third photo shows the finished star wheel after filing the teeth to size using the initial divisions to maintain equal spacings. 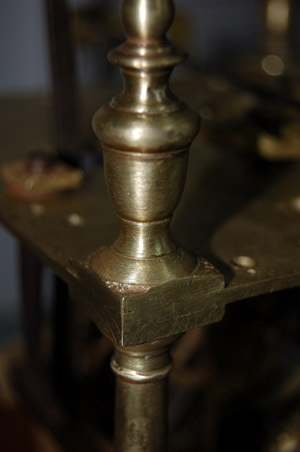 The steel mandrel was later reused to form the hand arbor. 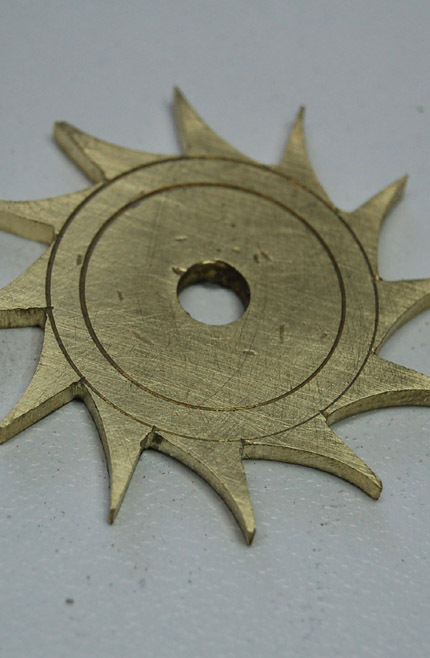 Below are photos showing the almost completed hand arbor and star wheel assembly. The arbor is yet to be cut and have the hand square filed to size. I needed a suitable single hand for the clock and since nothing original was ever likely to turn up, I planned to make one. 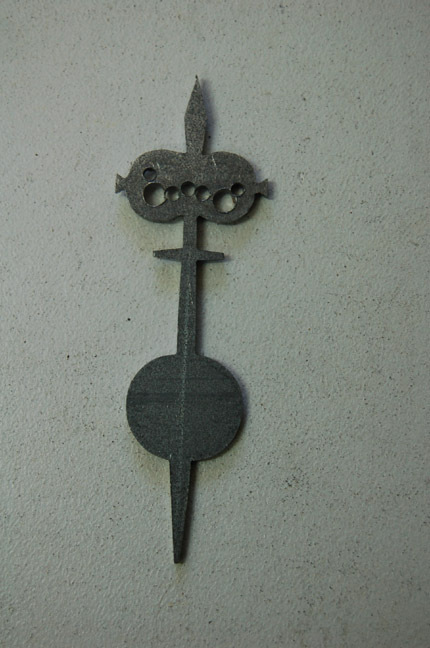 I chose a design appropriate for the era from one of my lantern clock books and drew it up on a piece of 2mm steel. The following photos show the steps. It’s a lot of work and tedious hand filing but when finally blued it looks just great. The striking train needed some help as the ratchet on the chain wheel occasionally slipped. 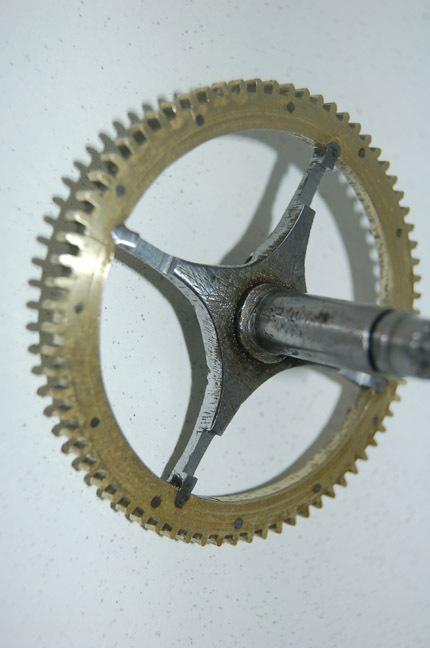 On inspection the click on the chain wheel had worn away a goodly portion of the spokes on which it acted. 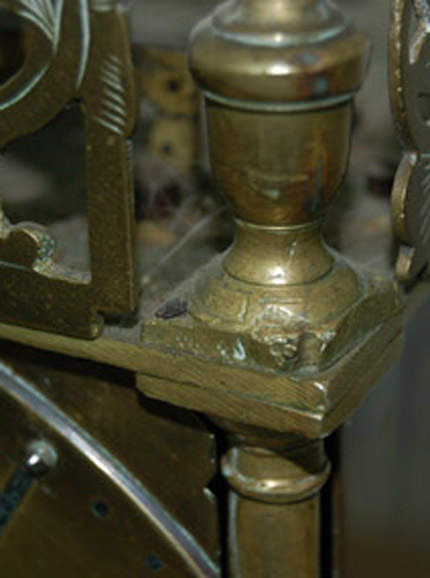 This is normal wear for an old clock but meant remedial action was needed. 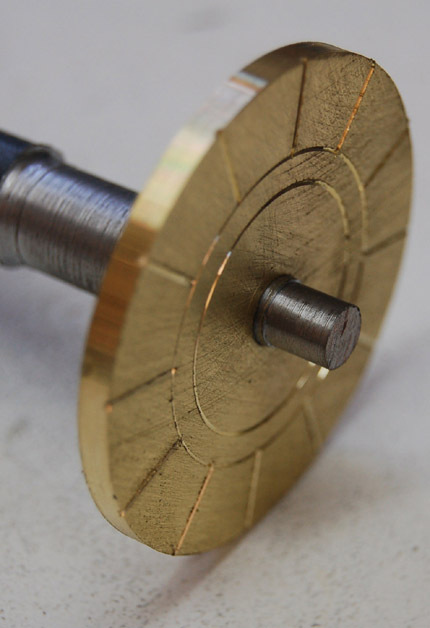 Unusually this chain wheel has a steel spoked centre inserted into a brass wheel. 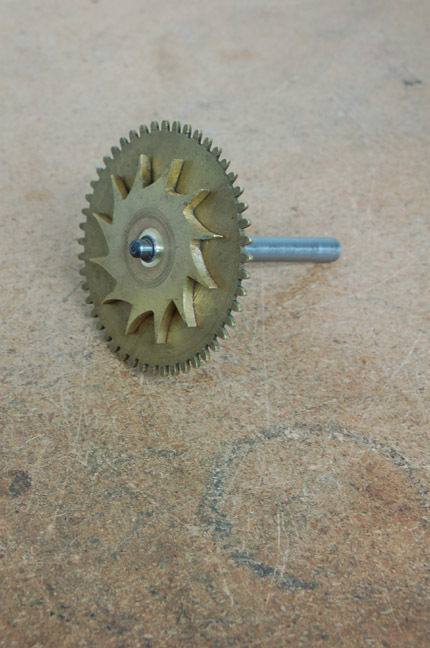 It looks very old and is possibly even original as it’s an excellent fit and the wheel rotates perfectly evenly. Of course the steel spokes withstand wear much better than brass spokes. 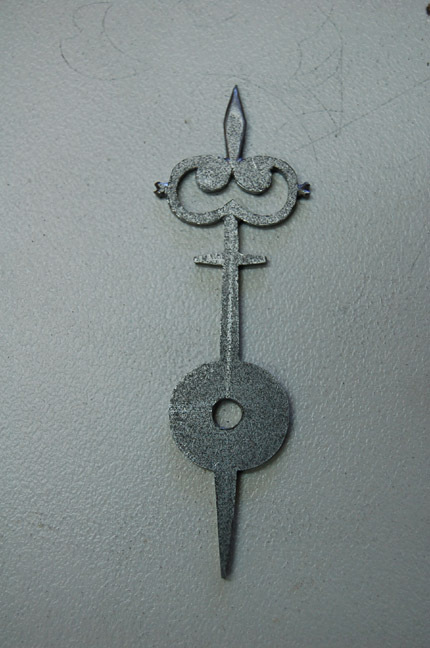 The worn parts were filed out and new steel soldered in and filed flush.